The FX markets in 2015 have been defined by the De-Risking phenomenon: investors have fled from risk into the main hard currencies, namely XBT(Bitcoin), USD, CHF and JPY. They have retreated from VEF, UAH, BRL, ZAR, COP, RUB. XAU (Gold) weakened somewhat, a signal perhaps that it is losing its safe haven status. Note that the money used in the world’s freest financial system — Bitcoin — has appreciated the most, and the money used in the world’s most Socialist and regulated economy — Venezuela — has lost the most value. Bitcoin price appreciation against USD p.a. 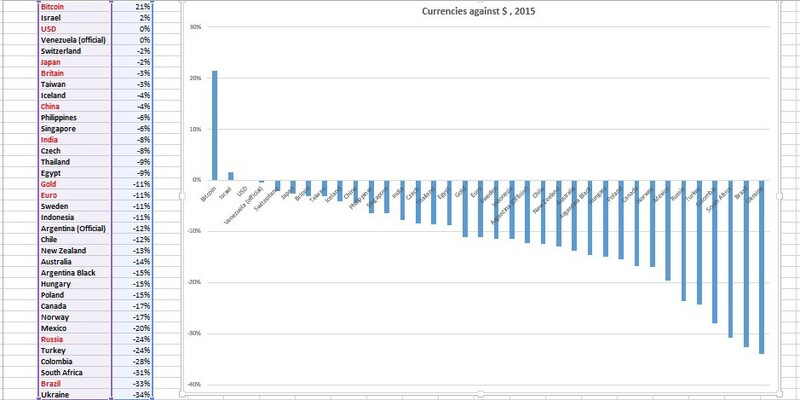 Currency Data from Economist for 10 December 2015. Data for Argentinian Black Market rates from @DolarBlue on Twitter. Data for Black market Venezuelan Bolivar from www.dolartoday.com. There’s an argument to be made that Bitcoin is the top performing asset in 2015. Since 1 January it has increased from $314 to $431, i.e. by 37%. The Economist identified Hungarian equities as the best-performing asset of 2015, which increased by 34%. The results from my own calculations performed on exchange rates as at 12 December 2015 follow. A Big Mac bought in Venezuela with black market Bolivars costs the equivalent of $0.14. The situation in Venezuela is crazy. There’s an interesting travel account here by The Broke Backpacker who describes his experiences buying money on the black market. And more here.